(Phys.org) —Improved satellite measurements and computer simulations of ice sheets are creating a more accurate picture of the current and future rise in global sea level, according to an international team of climate experts including Slawek Tulaczyk, a professor of Earth and planetary sciences at UC Santa Cruz. The team's study, published in the June 6 issue of Nature, found that Antarctic ice loss might be only half of what has previously been reported. 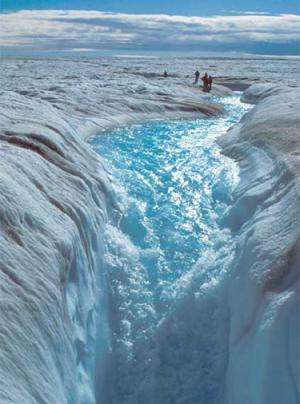 But the researchers also confirmed a major loss of mass from the Greenland Ice Sheet, calculated to be twice as large as the Antarctic contribution to global sea-level rise. The collaboration, led by Edward Hanna of the University of Sheffield, brought together scientists from twelve polar research centers across the world to study advances in both observations and simulations of ice-sheet mass changes. Global sea level is currently rising at a rate just over three millimeters (about an eighth of an inch) per year, due to a combination of melting ice and the expansion of seawater driven by warming. Future increases in mass loss from the Greenland and Antarctic ice sheets are expected to significantly enhance the rate of global sea-level rise as these ice-sheet changes become an increasingly dominant contributor. Considerable uncertainty remains in predictions, however, as ice sheets show a complex response to climate change, which is only now becoming apparent through the use of improved computer models. The Nature paper, "Ice-sheet mass balance and climate change," shows how uncertainties in modeling methods have been reduced thanks to better theoretical understanding of ice sheet physics and advances in measurement techniques that make use of radar, laser, and satellite data. These advances allow scientists to better predict the impact of climate change on ice-sheet mass balance and global sea-level rise. Many of these improvements took place since the 2007 Intergovernmental Panel on Climate Change (IPCC) Report declared that understanding of ice sheet behavior was insufficient to reliably predict future evolution of ice sheets in Antarctica and Greenland. Tulaczyk, who has been studying the physics of ice sheet motion for the the past two decades, reviewed advances in how ice-sheet boundary conditions are treated in computer models. "Since the 2007 IPCC report, the pace of improvement in representing key ice sheet processes in numerical models has been really impressive," he said. "However, there are still significant gaps in knowledge, and assumptions used to bridge these gaps tend to make simulated ice sheets change relatively slowly over time. The danger is that this bias may make it difficult for computer models to predict a sharp acceleration in ice sheet contribution to the rate of future sea level rise." Hanna, the paper's lead author, said estimates of mass change of ice sheets have begun to converge in the last year, although considerable uncertainty still remains concerning the current rate of mass change for the Antarctic Ice Sheet. "We believe the current contribution to global sea-level rise from the Antarctic Ice Sheet might be only half that reported in some previous major studies just a year or two ago," Hanna said. "We also confirm previous results suggesting an accelerating major loss of mass, at double the Antarctic rate, from the Greenland Ice Sheet." ""This study shows once again that the IPCC is far from alarmist, but in fact has under-estimated the problem of climate change. That applies not just for sea-level rise, but also to extreme events and the Arctic sea-ice loss."" This report won't change anyone's mind. Alarmists will still alarm and denialists will still deny. If the majority of people ever start taking their impact on this world personally by developing a culture of sustainability through recycling, waste reduction, consumption reduction, population reduction and geopolitical energy self sufficiency - at that point we will be a more responsible species. We will all be better off when one group of people no longer feels the need to take what another group of people has, which heretofore and sadly, seems to be one of the defining characteristics of humanity. Antarctica is 90% of Earth's ice and is so terribly cold, way below the melting point of water, it is exactly because of recent mild warming that evaporates more ocean water that its ice mass is *growing*. While Antarctic sea ice is growing, and the interior of East Antarctica is gaining land ice, overall Antarctica is losing land ice at an accelerating rate.